New Years Eve, the perfect night for a party and getting together with friends. Celebrations can vary from parties in restaurants, pubs and hotels as well as parties at home. Our New Years Eve party products will give you lots of New Years Eve party ideas and are suitable for all events and add a lot of fun and atmosphere. Wherever you are seeing in 2015, New Years Eve party themes are always a popular idea particularly a colour theme such as Black and Gold, Black and Silver or alternatively just Silver or Chicago Swing. If you are attending a private party the guests are often encouraged to also dress according to these colour themes. For a party full of mystery and intrigue another themed option is a Masquerade Party and our Masks are sure to wow! They include Eyemasks, Feathered Masks, Sequin Masks and Masks on a stick and with themed masks such as Roaring Twenties there is plenty of choice. If you are having a party at home this is the time to go over the top with New Years Eve Party Decorations. These could include Happy New Year Hanging Decorations in both Black and Gold and Black and Silver which would blend in well with those colour themes. New Years Eve Party Packs are the perfect way to make choosing and shopping easy. However big or small your party is our packs range from ten to a hundred people and there are also packs of various Happy New Year Hats and Tiaras. 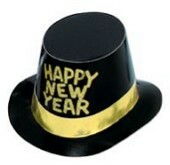 Handing out New Years Eve Party Hats and noisemakers such as Blowouts as the New Year is approaching keeps the party going. As 2015 comes in there has to be the traditional explosion of Party Poppers to go with the wishing of everyone a Happy New Year. Choose from Gold or Black Cone Poppers or Holographic Poppers to hand out to your guests to keep the party mood going. The best way to start a new year is sharing a party with friends and family and these party supplies will always make an impression and with our choice of delivery options shopping during this busy time couldn’t be easier. Have you started planning where you are going to be for New Years Eve? Please let us know about your party plans.